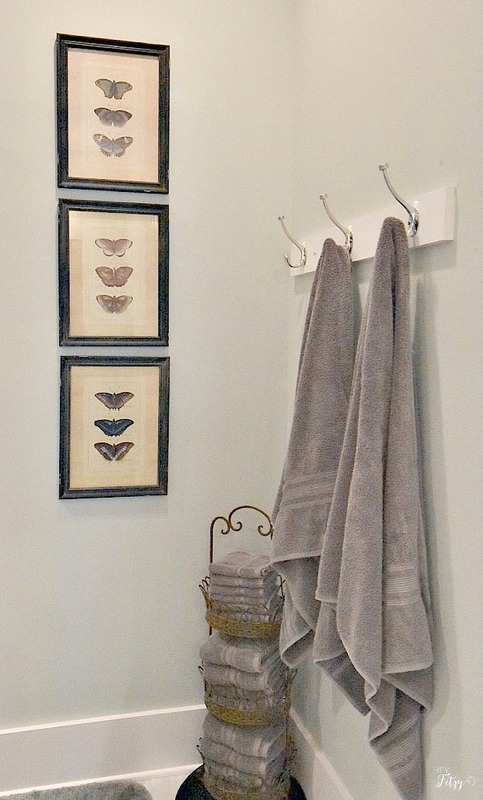 It's time for our First Friday Home Tour and you're going to love this one! Today we are visiting Tammy's home. Tammy blogs over at Hey Fitzy. I had the pleasure of meeting her at the Haven Conference a couple of years ago and she's as sweet as can be. Tammy really caught my attention when she participated in the One Room Challenge last year and made over her pantry. It turned out to be magazine worthy! I'll let Tammy do the talking. Hi Friends! My name is Tammy and I blog over at Hey Fitzy. With four crazy kids and two wild dogs my goal is to turn chaos into comfort. Keeping it simple helps keep me sane as I constantly run here and there trying to manage our household. The kids are busy which means this momma is busy. I wouldn’t have it any other way but man is it a wild ride. You can click here to learn more about me. Over the summer my family relocated from Minneapolis, Minnesota to the great city of Nashville, Tennessee. This was a welcomed move as we tried to get closer to family and warmer weather. We also downsized during the process and are still trying to get settled into our new home after three short months. Our home was a new build and already under construction when we went under contract. The house was far enough along in the construction process that we were unable to select any of the finishes. To be honest, some of the finishes we love while others were not exactly what we would have selected. Thankfully we love to DIY house projects so you can only imagine the list of projects we are excited to work on for this house. Here is our master bath. 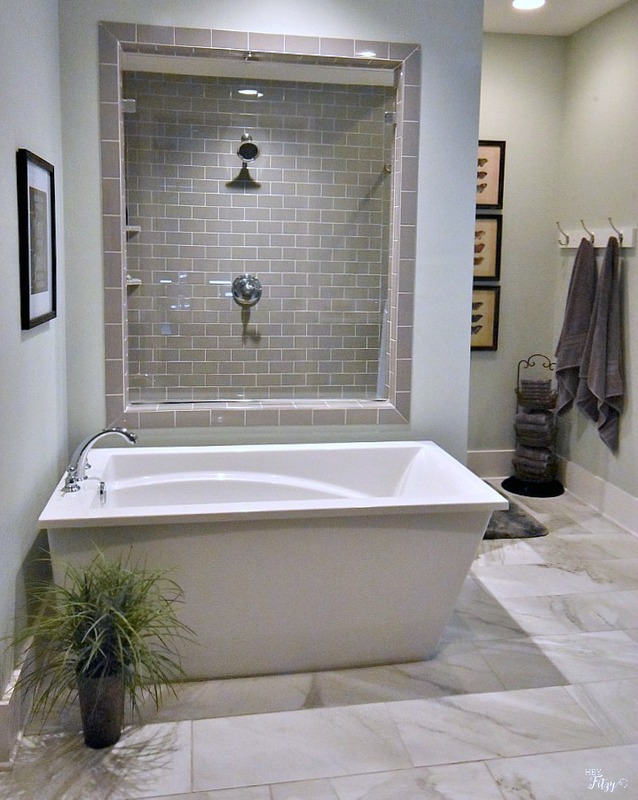 It has a great walk in shower with a beautiful garden tub. My kids love a good bath and were fighting over who got to use the tub first when we moved in. Even I didn’t win that battle, as I believe my youngest got to go first. I was so thankful this home had a wooden staircase. After so many years vacuuming carpet on the stairs, I truly longed for a wooden stairway. The kitchen is where we spend almost all our time as a family. Enjoying meals, grabbing a snack, doing homework, or sharing moments during the day, this truly is the heart of our home. Back to Stacey talking now....isn't Tammy's home pretty? I love that new kitchen of hers! I wanted to point you to some really neat things over at her blog. *Tammy was recently invited to the HGTV Urban Oasis in Knoxville, TN. This was an amazing opportunity and her pictures are wonderful. *A mom of four has to know how to make great food. You'll find a wealth of recipes on her blog. *Her Christmas home tour from last year was gorgeous! 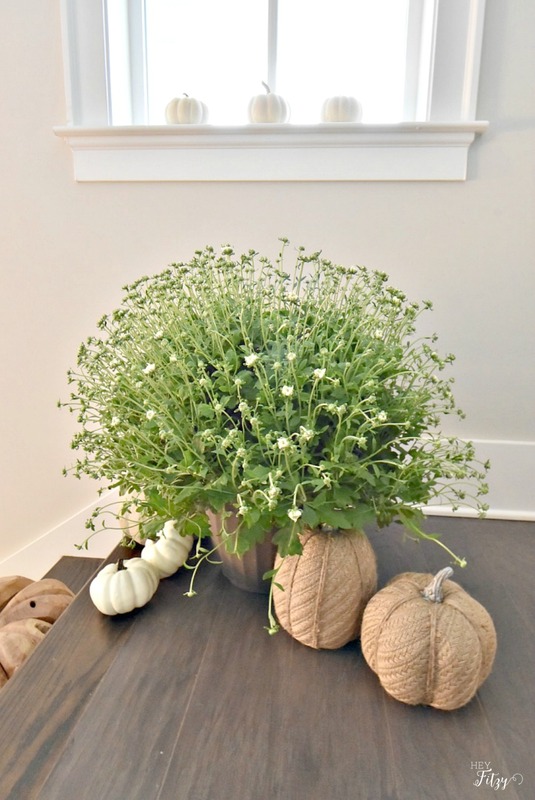 *Want to know how to make a fun acorn garland? She's got you covered. I hope you enjoyed this fun southern home tour. Tammy, thank you for allowing me to feature your homey retreat. 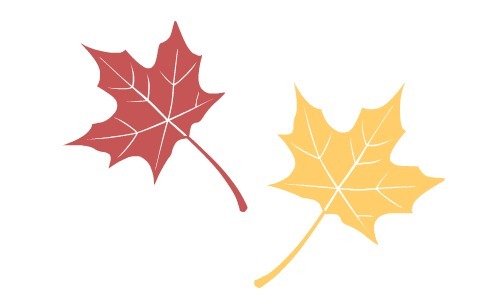 Beautiful fall tour, I love it. Her kitchen is my favorite, along with the bathroom. I'd fight to take a bath there too! That kitchen is gorgeous. Thanks for sharing the tour. What a beautiful home. Thank you for introducing me to her! What a pretty home! I love all the shades of gray in Tammy's home. Welcome to the South, Tammy! What a gorgeous home! With all the acorns I need to make a garland! Thank you for the wonderful opportunity to share my new home! Beautiful home tour. 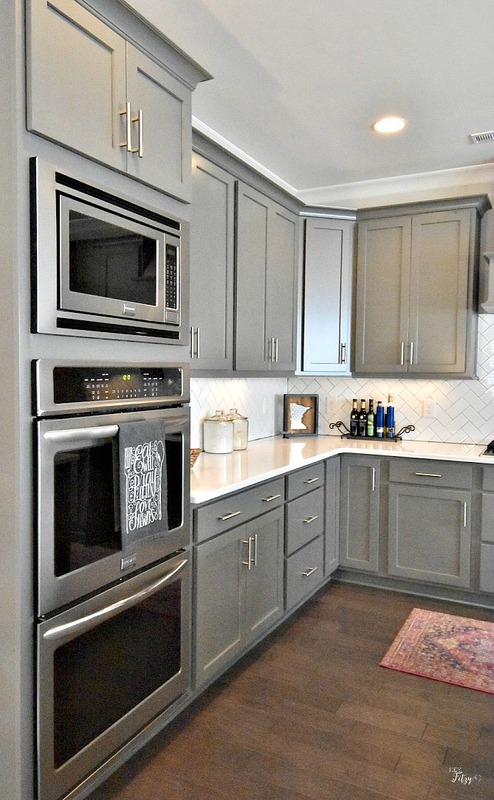 I love the gray kitchen cabinets. I love the kitchen. Such an inviting vibe and plenty of room for people spend time together. Wow, do I ever love that kitchen of hers and the fun, neutral pumpkins. I love this feature, Stacey. What a beautiful home! Have a wonderful weekend. Gorgeous welcoming home! 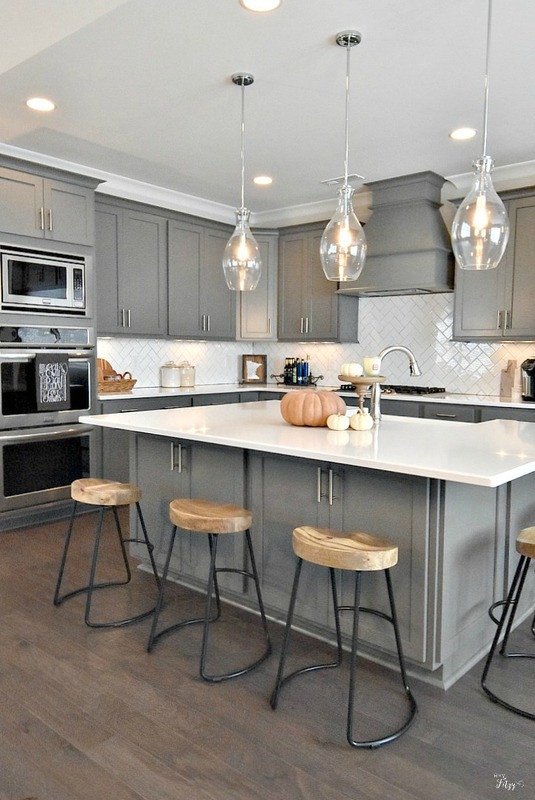 I love the kitchen and the runner in the kitchen is just the perfect color combo! Such a happy warm space! What a beautiful home...can't wait to hop over to her blog. The new home designs and finishes are so different from houses even just 10 years ago. Have a wonderful weekend! Stacey, a lovely tour of Tammy's home! I love the kitchen! Very pretty! That bathroom is a dream! How dreamy is her home. So cozy and pretty. Love that bathroom. Thanks for the tour of such a lovely home. Love the pumpkins -- I just want to know how she keeps it so clean and neat! Very pretty home, and Tammy sounds like a really sweet girl. Nashville would be the place I could move to in a heartbeat. Love that tub and the kitchen looks pristine!! Going over to her blog to visit! What a pretty home she has! 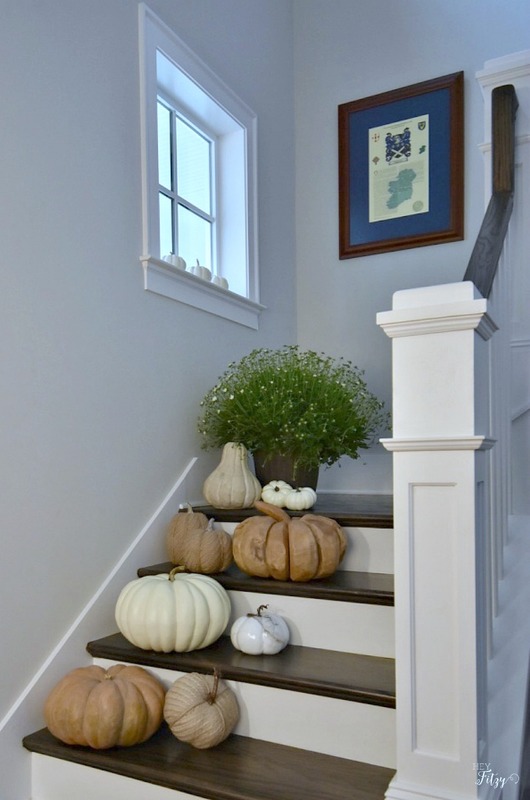 Love the pumpkins on the staircase. My daughter would love this, her whole house is gray and white. So pretty! Very pretty! 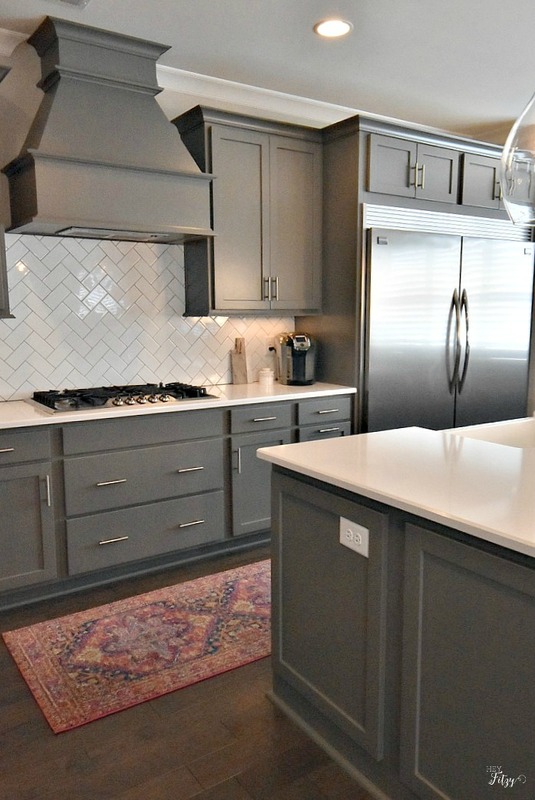 I especially love that red rug next to the gray cabinets! Thank you - this is a new blog to me. I don't think I would EVER leave the bathroom. Such a lovely and functional kitchen space. The family must really enjoy living there. I know I would. Not sure if I would camp out in the bathroom or the kitchen the most...but in any event, I'd be in one of those lovely spaces! Enjoy Franklin! Pinned that little coat cubby area, it's simple and clean, but as a fellow Minnesotan I'm not sure mine ever looks like hers as far as the clean part goes! Tammy's home is amazing - and how a mother of four can find the time to do any decorating or blogging is beyond awesome! Her grey kitchen is gorgeous and her master bath is so unique!